While many plants flower in order to reproduce, flowers for bouquets and floral arrangements are grown specifically for that purpose. Flowers for cutting are grown in a variety of locales, depending upon the type of flower and the season. Major flower markets and suppliers import flowers year-round, enabling them to sell early spring blossoms and those that thrive in summer’s heat all year. Flowering plants are the dominant plant type on the planet, ranging from plants that we harvest for cut flower bouquets to those that we eat, like wheat and corn. The fossil record shows evidence of flowering plants 136 million years ago, according to paleobotanist James A. Doyle in a 2009 “New York Times” article by Carl Zimmer. Flowers diversified approximately 120 million years ago, leading to many of the varieties we recognize today. Most cut flowers are grown in warm climates that allow flower production through much of the year. Domestically, 75 percent of cut flowers are grown in California, with a small percentage produced in Washington, Florida, Hawaii and other states, according to AboutFlowers.com. Significant numbers of cut flowers are imported, particularly from Colombia and Ecuador. 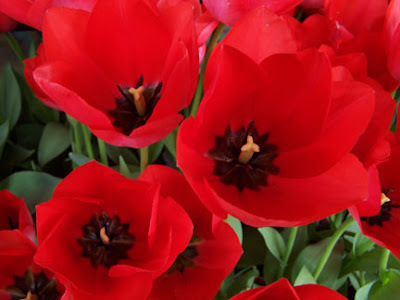 Climate and soil conditions in South America are ideal for flower production, but you may find Dutch tulips or even local wildflowers at some flower sellers. Labor standards have been an issue in the flower trade, with concerns about long working hours, poor housing conditions and transportation, and sexual harassment. Reputable sellers and growers, like those used by ProFlowers, implement fair working standards and conditions. ProFlowers maintains a code of conduct for flower sellers, setting out and promoting guidelines for subsidized food, adequate transportation and adequate compensation for overtime work, as well as banning child labor. Growing flowers, like other forms of farming, comes with some degree of environmental risk. Good floriculture practices, like those encouraged by the ProFlowers Code of Conduct, reduce the potential for environmental damage while protecting the safety and health of the workers on flower farms. Water use, fertilizers and pesticides can all impact the health of the region and community where flowers are grown for commercial use.